Welcome to my Trip Report on Xiamen Air's Boeing 787 Dreamliner Ride! *Photos of aircraft are credited to the respective photographers from airliners.net. For my part 1 (SIN-XMN), click here , part 3 (PEK-XMN), click here and part 4 (XMN-SIN), click here. My wish came true when my ride was confirmed the Boeing 787 Dreamliner Dash 8. Few days before the flight, I checked the history of the flight regarding the aircraft type deployed. The Boeing 737 and 757 operated on my flight for the previous 3 days, I didn't mind flying on the 757 aircraft as its getting rare to fly on one especially in Asia, but certainly not the 737. I would be very disappointed if I had gotten that aircraft. The last time I flew on the Boeing 757 was on Delta Airlines in U.S but that was a long time ago, not much memory of the flight. I did a check on the website, the 787-8 was flying on the date I was departing on. On 26th August 2013, Xiamen Air finalized the order for 6 Boeing 787-8 Dreamliner aircraft after the airline announced its interest in the aircraft with Boeing in May 2011. 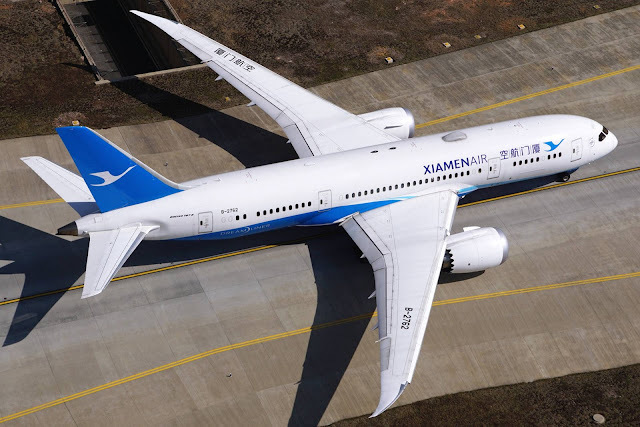 The list price of the order is around US $1.3 million and for now, (Sept 2015) the airline has taken delivery of 5 out of 6 Boeing 787-8 Dreamliner aircraft. A couple of months ago, another 4 more 787s were ordered. Not only that, the airline has plans to buy another 10 more in the near future to expand its network especially in U.S, Europe and Australia. I stayed at the Ibis Xiamen Hotel Kaiyuan which is about 20 minutes drive from the airport. The room is quite comfortable and isn't expensive. I didn't go anywhere far from my hotel, just did some walking nearby to catch a glimpse of Xiamen and the people. I have to say that the city is quite clean and I met mostly pleasant people while exploring around. Here are some photos of it. Reminds me quite a bit of Taipei. Its pleasant and safe to walk around the city. Only thing bothers me is some drivers tend to honk and honk, but its not as bad as before. As I couldn't do the online check-in, I had to go to the airport earlier to do so. I did a check on the airline's website once again, and the Boeing 787 indeed was assigned on my flight. Airlines can still make last minute changes and I had that experience before on this Thai Airways flight. I left the hotel at 0600 and reached the airport around 0615. Taxi fare cost me around 35 yuan and usually I give the taxi drivers some tips. So far 4 rides on the taxi, none of them bother to thank me, sad really. Once I am at the airport, I went to the domestic check-in counter to do my check in. The staff answered my enquires, and before I knew it I was on my way to the departure hall. Here are some photos of the domestic side of Xiamen Guo Qi Airport. I find it to be quite a pleasant and passenger-friendly airport. There are English signs everywhere, so easy to travel around. Free Wifi is available, but you need to register your cell phone number to get the code in order to use it, similar to Changi Airport. (Singapore) At least over here, the wifi is available everywhere. It was quite busy at that period but there were many counters opened for Xiamen and China Southern's passengers. It didn't take long for me to get my boarding pass and luggage checked-in. C4 was where I queued up. The staff confirmed my aircraft type and got me a window seat near the rear. Looking so forward to flying the airline's Dreamliner, at this point. For international departure, this is where you go. There are some snack shops for anyone who is lazy to get them in town. Somehow the interior reminds me of the domestic airports in Taiwan. Even though it was only 6.30 in the morning, it was quite busy. Once I was done with my exploring, I made my way to the domestic air side. Interesting painting of the aircraft at the air side. There are duty free shops along the way to the security check. The airport is pleasant and organised. From what I know, the Boeing 787-8 Dreamliner usually parks at Gate 8 and 9. 2 little ones were admiring the Boeing 787-8 Dreamliner aircraft. Aviation enthusiasts can be pleased to know there are windows for them to take photos of the aircraft movement and even better still, the single runway is in front of the tarmac. I walked to the other end to take a look. The staff are ok with photography. First Class Lounge for China Southern and Xiamen Air's passengers. These gates require buses to ferry the passengers to the aircraft parked away from the terminal. Waiting for my aircraft to arrive and B-2762 made its appearance. Soon, the aircraft arrived. From the look of it, the aircraft was parked at a remote parking lot as it was being towed. Preparation of the aircraft was quick and we boarded the aircraft about half an hour before schedule departure time. These passengers were on the same flight as me and a few of them noticed the aircraft being different from what they usually fly on (737). My ride: B-2762 was towed into my gate. At that time, the airline was operating 6 of this aircraft type and B-2762 was the newest, only 3 months old. I was one of the first 20 passengers to board the aircraft, it was an exciting moment for us as our cameras went snapping away as we walked in to our assigned seats. I wasn't alone and thanks goodness, the cabin crew didn't stop us. Later on, the Captain announced that we were to be delay for an hour due to Beijing's military exercise going on near the airport and I took the chance to walk around the cabin to snap more photos. Seeing that the curtain of the business class was opened, I went over there to snap a few shots. No one stopped me but later on the crew went to close it! (To prevent others from doing so - I guess), lucky me! The cabin crew for this flight were nice and seemed to be happy working on the airline's first wide-body. I managed to chat with one later during the flight and she told me that only a handful were selected to work on the long haul flights (787 flights) and usually the most experience and those with clean records get the priority. She, along with the others including the flight crew are absolutely delighted with the aircraft. For this flight, I received smiles from the crew and felt their warmness and friendliness from the start to the end of the flight, that's the way it should be. The service was certainly better than my previous. Credit goes to talkairlines and you can check out more info over here. This is the Zodiac Apollo seats configured in 1-2-1 configuration. Just 4 seats in the very first row of the aircraft, they are the most luxurious product offered by the airline. It doesn't really stand out in my opinion, looks more like some of the major airlines' business class but experiencing it may be different. Like they say, looks can be deceiving. This is the Zodiac Arua Lite seats in 2-2-2 configuration. I have tried this product before on Royal Brunei (Trip Report), its may not be the best product out there, but still comfortable for medium-long haul flights. There are 2 sections of the Business Class. If you look at the seat map, there is one row between the crew's work station and the economy class. Private feeling one can feel but it can be noisy. These photos are taken at the front cabin. I find the colour of the seat and the pillow mismatch, what do you think? This single row of seats is between the Economy Class and the crew's work space. The Ottoman is pretty useful, you can stuff your shoes at the lower compartment and rest your legs on it. This is the Zodiac 5751 seats in the 3-3-3 layout. Its about 33-inches and I find it to be quite comfortable. I was lucky to have the whole row to myself and I could enjoy every minute of flying on this sector. I prefer this over the purple seats on the 737 and definitely matches with the crew's uniform better. Doesn't this reminds you of KLM? Looking at the inches, its pretty comfortable. The 3-3-3 layout now is standard among the 787 operators. Many complained about this configuration but personally, I find the 3-4-3 on the Boeing 777 slightly worse. Unlike the narrow-body aircraft, this new generation aircraft is fitted with touch screen TV with AC power plug and USB port. The thing I am wondering is the USB port is commonly used to charge cell phone and if many uses it to do so, I am sure they will be turned on. The announcement of welcoming passengers kept replaying and I got tired of it after a while. The recorded announcement was done in English (American male voice) and Mandarin while the crew's announcement was in English, Mandarin and Dialect since this was a domestic flight. The English announcement made by the crew was understandable, and the Captain made a couple of announcements during the flight in both English and Mandarin. This was my seat and as you can see, my flight was not going anywhere soon as the cargo door was opened. Photo taken from my seat, you can see Boeing's sky interior which is my favourite. My impression on board the Boeing 787: I feel less dehydrated while flying at cruising level, the electronic dimmed windows and the comfortable cabin interior makes me feel at home. The popular electronic dimmed windows and there are 5 different settings to it. The last row of the cabin and the cabin crew's work station is sealed off to passengers. Only the last row of the aircraft is 2-seats at both the window seats, this is due to narrow fuselage near the rear of the aircraft. More passengers boarded and the ground engineers were on board to check some stuff out. No one stopped me from taking these photos, that's great. Cabin crew's uniform certainly matches the cabin. The last row of the Economy Class seats can be reclined. When the Captain announced the 1 hour delay, I went around to snap a few more photos. Most of the seats were occupied at the first section of the Economy Class. The rear cabin of the Economy Class was pretty empty and I am one of the lucky ones to have the whole row. The different lighting and do notice the electronic windows in different mode. The airline's name should be added just below the logo, do you agree? Whole row for myself is fun. Disembarking time and it was a wrenched feeling leaving the aircraft. 2 hours on board this aircraft is definitely not enough especially with the whole row for myself. I find the seats to be quite comfortable especially with the 33 inch. I was lucky enough to have the whole row free so I didn't feel the effect of having to sqeeze with the person sitting next to me. I felt that the airline has gotten itself a good Economy Class product on this long haul aircraft and its certainly an upgrade over the Boeing 737 and 757's IFE product. 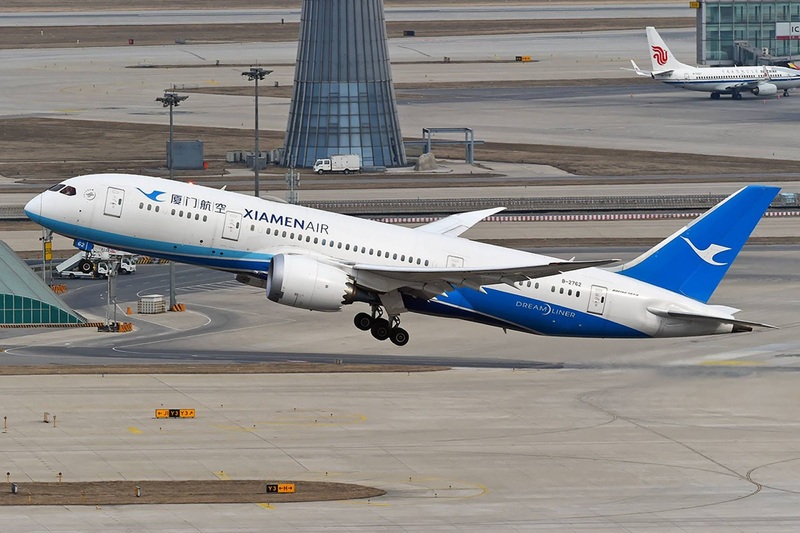 For those who book on domestic flights such as Fuzhou to Beijing, Xiamen to Beijing and return flights, there are some 787 operated flights but do take note that aircraft change can take place, so don't be disappointed if your aircraft is changed to either the Boeing 737-800 or Boeing 757-200. I was very fortunate to fly on this aircraft as the day before and the day after, this flight was operated by the Boeing 737-800. You can imagine my reaction if I have gotten that aircraft instead of this! The airline uses the Panasonic Avionics for the IFE system on board this aircraft and also the Wi-Fi service which was not available on both of my flights. This is the Ex3 system that offers passengers high definition screen, featuring AVOD (Audio Video On Demand) movies, games, entertainment and it also comes with USB port. The AC power point is located near the hand rest on the seat. Camera view is not available on this system and its features are quite limited especially compared to the likes of Emirates. When announcement is made, whatever program you are watching will come to a pause. The USB port, its a must for travellers. This is the start-up screen, quite plain. Languages are available in English, Mandarin and local language depending on where the airline is flying to. The airline is showing the recent blockbuster movies and I caught San Andreas which I missed out at the local cinema. The Flight map - lots of airlines are using this system. CAAC is pretty strict about it. Welcome on board, Xiamen Air! The sound and screen quality is acceptable. I was able to listen to the earpiece without being disturbed by the cabin noise and Panasonic's screen is one of the best in the market. The airline has to detour a bit to avoid the bad weather. The history of this airline, Xiamen Air. Overall, I find this system adequate for international flights. I am quite experienced with this system as I have used it on other airlines. The touch-screen sensitive is good but if you don't like using the touch screen, the remote control is available just below the IFE system. The downside of this system is the contents is limited and the design of the icons on the start up screen is too plain for my liking. Overall, it is user-friendly and should have sufficient programmes to keep the passengers entertained. I went to the toilet to check it out, here are some photos of the interior. Can you see the difference between this and the other aircraft? Notice the blue thing? That's the hand sensor to flush the toilet. I prefer this door than the newer type on other operators' Boeing 787. What can you expect when flying on the Economy Class? 33' inch legroom space, adequate for a 6 foot 4 person like myself. The drink holder is very useful. Even though the window is dimmed, you are still able to view outside. The earpiece provided by the airline and you can take it home. This is where you can plug the earpiece to, its located at the hand rest area. Every row will have 2 AC power point for the 3-seater. For the 2-seater, only 1. Just 10 minutes after the Captain announced the hour delay, the crew made an announcement that the aircraft was ready to go. No explanation on it but some of the crew came around to inform the passengers to return to the seat and switch off the electronic devices as we were departing. Not so good news for me. If I had to be delayed, I would rather have it on this flight as I could enjoy the 787 Dreamliner cabin longer. Push back took place slightly late and the General Electric engines were started. The start up is definitely not as noisy as the GE-90-110/-115B engines which powered the Boeing 777-200LR/-300ER. The aircraft taxied to the runway for a quick take off to our destination, Beijing. The ride there was generally smooth with a few bumps in the middle, but nothing bad. The Chinese pilots are not as strict as the Taiwanese, but they turned on the seat belt sign on when the turbulence got a bit worse and the crew had to suspend the service. Announcement was made in both Mandarin and English when it happens. I find that the airline practices safety pretty well, no wonder it won the 'Best Safety Record' award in 2013. You can be assured of safety when flying with this airline. When the cabin was prepared for arrival, the crew came around to ensure that everyone was in the correction position for landing, and a few crew came around with sign board informing passengers to switch off all electronic devices and also the recorded announcements were made. I think its a bit too much, but like I mentioned earlier, the airline is serious about safety and I prefer it that way. For the short 2 hours flight, a hot meal was served with peanuts and drink. For drinks, the crew offered refills. A hot towel for each passenger was also issued to the passengers. The crew offered refills during the later part of the flight, thumb up for that. A box containing snacks and cutlery and the hot meal were served in this way, I suppose its easier to dispose. I had the choice between chicken and pork, I chose the latter. Overall I was quite pleased with the meal, it was not bad especially the meat. A couple of Boeing 757s were spotted from the distance. Push back commerced and engines were started. The taxi to the runway took less than 10 minutes. Off we went after waiting for 2 arrivals. The ride was pretty smooth at this point as we climbed towards our assigned flight level. Once the seat belt sign turned off, the electronic windows was set to dimmed mode by the crew. I was able to adjust it as it wasn't locked. Weather was much better when we were near Beijing. The ride was pretty smooth until the landing which we had a bit of crosswind. Preparation of landing commerced and the windows are set to normal mode by the crew. Making a turn and we were within minutes away from the airport. We were soon on final approach. All those strange noises you hear are from the flaps and speed brake (slowing the aircraft down). Certainly a beautiful day for flying. Touched down and I spotted many aircraft for my first time. Example: Hainan Airlines Boeing 787-8 Dreamliner. Beijing Airport is huge and we took around 20 minutes before reaching our gate. Not much traffic at this time of the day. My 2nd time at Beijing Capital Airport! Thanks for the wonderful ride, B-2762! This is the arrival hall. It was time to explore the terminals. More photos of Beijing Airport in my next trip report. 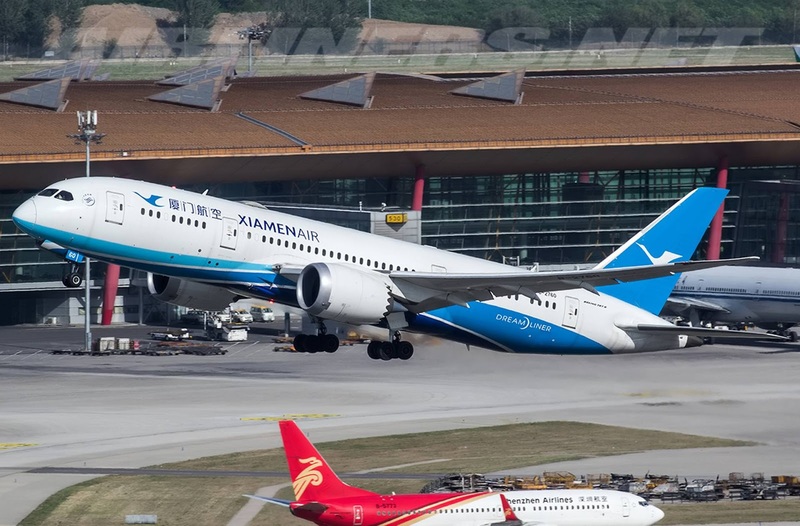 Xiamen Air's Boeing 787 has better products than the 737-800 and 757-200 and is worth flying on domestic and international flights. Cabin service may not be as polished as the top airlines, but it certainly has decent cabin products in all 3 cabins (First, Business and Economy). After experiencing it on a domestic flight, I believe flying on an international route such as Xiamen to Amsterdam won't pose a problem for me. There are lots of debate going on regarding 3-3-3 configuration on the 787, but personally its not a big deal for me. The 33' inch legroom space should be comfortable for tall passengers. Once you fly on the 787 Dreamliner, any other aircraft type with this airline is a downgrade. I will be doing the return flight on this aircraft type, will do a summary on my experience of this aircraft type, stay tuned! Another good report, Economy looks pretty impressive.